Ces photos... Ce lieu... Cette robe... Mettez tout ça ensemble et vous avez le combo gagnant ! 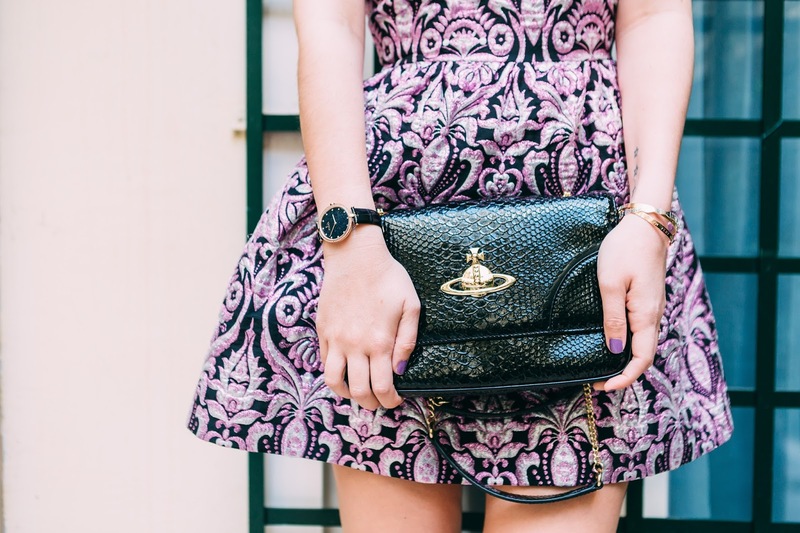 These photos… This location… This dress… Put them together and you have a winning combo! You know when you look at photos and then kind of take your breath away. 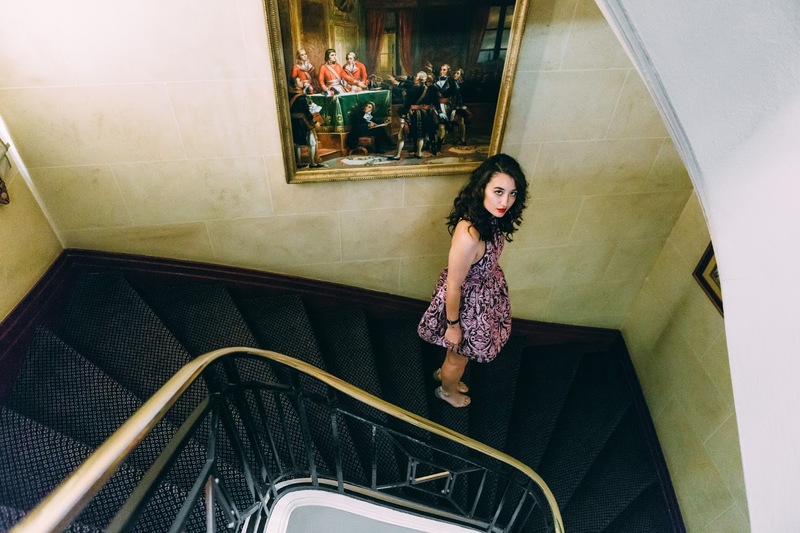 That's what happened when I got these photos from I heart Paris, after our shoot in Hotel Napoleon. 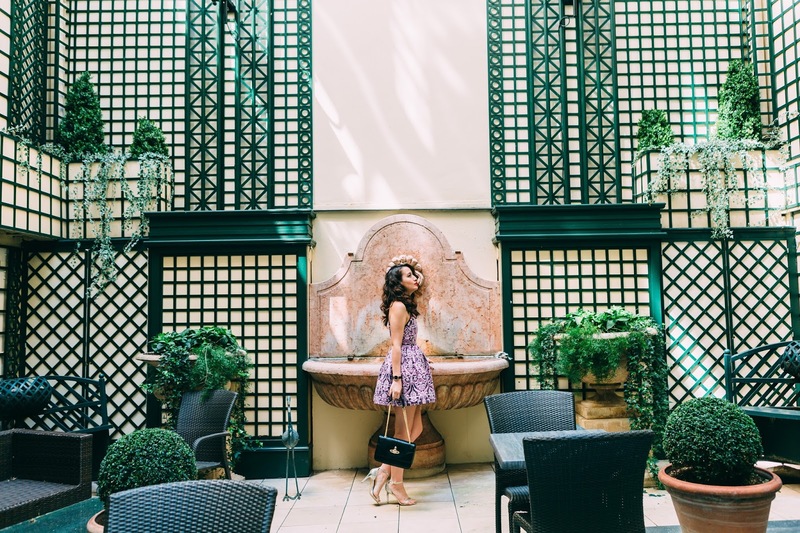 This secret garden tucked away in Hotel Napoleon was the perfect backdrop to show you my dress from Manoush. I've had this dress for almost a couple of years now, but never had the chance to blog about it. Instagramed it a few times but not sure why it never ended up on the blog.. But here it is...one of my favourite dresses from the whole of Manoush's collection. It's a really flattering fit for my body type, i'm always a fan of dresses that are fitted on the waist and then puff out… I think it creates a nice shape.. Ultra feminine and ultra leg slimming! You can also spot that my hair is a little different in this post.. It's curly! The reason? I was lucky enough to have a professional makeup artist working with us on this shoot so she could style my hair and make me look pretty… Something I never have time to do myself! Although I do wish I was a little more groomed… I'm currently thinking about colouring and styling my hair to give me an almost groomed look! La voilà donc – l'une de mes robes préférées de toute la collection Manoush. Elle a une coupe vraiment flatteuse pour ma morphologie ; je suis toujours très fan des robes qui sont ajustées à la taille et ensuite un peu bouffantes... Je pense que cela crée une jolie silhouette... Ultra-féminine et ultra-amincissante pour les jambes ! Vous avez aussi dû remarquer que mes cheveux étaient un peu différents sur ce post... Ils sont bouclés ! La raison ? J'ai eu la chance d'avoir une artiste maquilleuse qui a travaillé avec nous sur ce shooting, du coup elle a pu donner du style à mes cheveux et me faire belle... C'est quelque chose que je n'ai jamais le temps de faire moi-même ! Obviously, I am in love with these shoes, and this dress, and also this bag, lol. Your pictures are just, a little bit too much AMAZING! Good contrast between the colors of the decor and the dress. Such a great look. This dress is amazing and you are beautiful! OMG you are gorgeous ! Love your hair like this and you said it... Everything is perfect ! wow ce shooting ! Magnifique. La robe est de toute beauté et les chaussures aussi. Je comprend que quand tu es vu ces photos tu as eu le souffle coupé !